PSX Bushido Blade 2 (USA) "Slash Mode" in 04:20.23 by Dammit. Bushido Blade is a series of fighting games with a gimmick: everyone can die in one hit. This kind of gameplay lends itself well to time attacking and TASing. Slash Mode is an unlockable feature where the challenge is to kill 100 opponents as fast as possible. 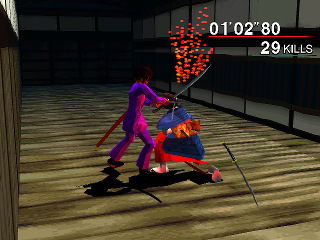 This game adds on to the original Bushido Blade's Slash Mode with an on-screen timer and more variety in enemies and environments. In this run, Dammit runs through Slash Mode as fast as possible, finishing with an ingame time of 3'34"76.